Whether air travel makes you wobbly at the knees or you just want to see a bit more of China, travel from Hong Kong to Beijing China by train is a very doable option. Below you’ll find sections on times, prices and passport control regarding travel from Hong Kong to Beijing China by train. It's a fantastic way to see the heartland of China and two fantastic cities. You'll see rice paddies and distant mountains from the window. You'll also cross the famous Yangtze River and pass through some stunning scenery in Hubei and Anhui. The whole trip takes you across two-thirds of the length of the country; it's a fantastic introduction to this incredible country. Timetables for the journey can look a little complicated, but once you get the hang of them, they are reasonably straightforward. For timetable purposes, Hong Kong is known as Hung Hom (the station name) and Beijing as Beijing West. Basically, there is a train every second day. The train from Hong Kong is the T98 and runs on even days. The train leaves at 12:40 and arrives in Beijing the next day at 13:01, almost exactly 24 hours later. The train from Beijing is the T97 and it runs on odd days. The train leaves at noon and arrives at 13:05 the next day. Ticket prices for Hong Kong–Beijing are as follows. All of the below are prices for one-way, adult tickets, children (5-9) tickets are around 25 percent cheaper. Under fives travel for free on the same seat or sleeper. The differences between the different classes are mostly related to the number of people who sleep in the carriage. Some of the superior soft sleepers will have private bathrooms, while superior and soft are in lockable compartments. The hard sleeper is an open plan, somewhat like sleeping in a hostel. It can be noisy even at night. 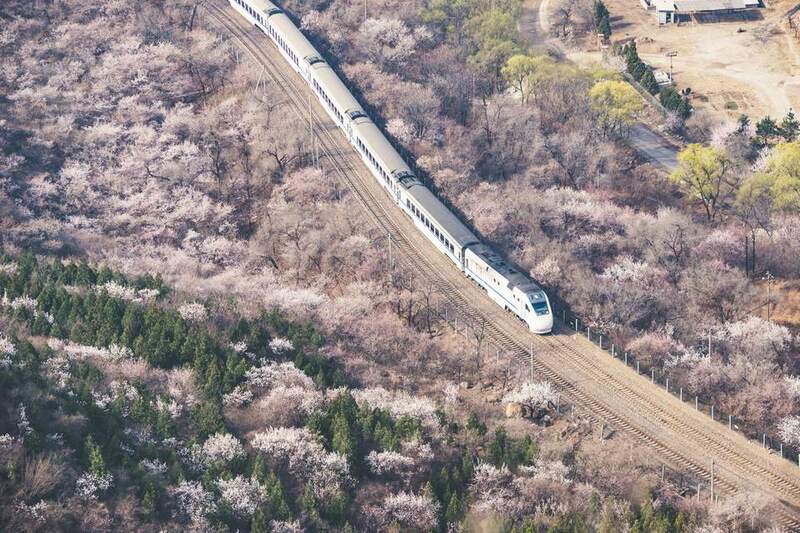 You should be aware that the train is quite popular and can be booked up a few days in advance, especially during peak travel holiday periods such as Chinese New Year. You will need to buy your tickets five days in advance, although this information is subject to frequent changes. Tickets can be bought from Hung Hom station itself, Beijing West and also the Hong Kong Ticketing phone line (00852 2947 7888). You can also use China Highlights, who has a straightforward English language website where you can book well in advance. There is a restaurant car on every train. You'll find a pretty decent selection of noodle and rice dishes, as well as cold beer and free tea. Remember, Hong Kong and China have a formal border, including passport control and customs checks. You will also, most likely, need a visa for China. You can obtain a Chinese visa in Hong Kong if you don't have one already. Passengers in Hung Hom should arrive forty-five minutes before departure for border formalities, in Beijing West the advised time is 90 minutes.